The Atlantic has redesigned its homepage to double the amount of stories that appear at the top of the page and display writers’ individual profiles in a new module. 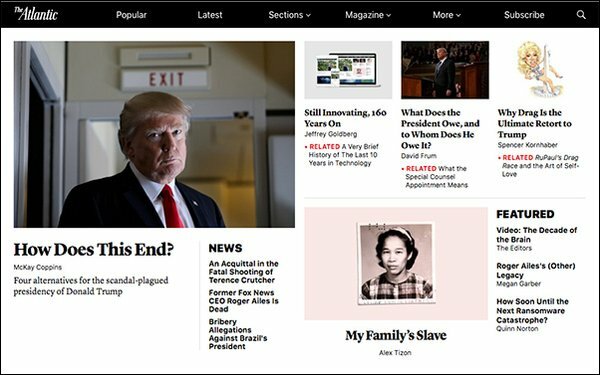 Editor-in-chief Jeffrey Goldberg wrote in a post introducing readers to the new homepage: “This new density (miraculously, our designers managed to achieve it without diminishing clarity) goes a long way toward solving a key problem of ours, that of too much great journalism, coming out too fast. This new design helps us feature more of our best work at once." The company said the changes were made to reflect “the rapid pace of today’s news environment.” TheAtlantic.com now features a “river” of most-recent posts to make the latest articles more easily accessible to readers. The Atlantic’s ad product team has also launched a new video ad product, the IMPACT+ HD. The unit claims to load faster and has better viewability across platforms. Sony Bravia OLED TV is the launch partner for the site's redesign, with a custom homepage takeover and a IMPACT+ HD video ad unit on the site. The redesign also improves ad positioning on the homepage. Sponsored content appears in the first screen and a high-impact ad is displayed higher on the page. The last time The Atlantic underwent a redesign was in April 2015. Since then, the site’s unique monthly audience has grown by 60%, with a record 33.7 million earlier this year. Separately, Time Inc.’s Southern Living will open two branded retail stores to coincide with Memorial Day weekend, one in Destin, Florida, and another in Huntsville, Alabama. It partnered with Beyond Brands Group, LLC, to open the two new stores. Southern Living opened its first branded retail store back in November, in Myrtle Beach, SC. At the time, Time Inc. said it was planning on opening multiple stores across the South under the magazine brand. The two new brick-and-mortar stores feature items from local Southern artists and producers, including 1818 Farms, Charleston Tea, Face To Face, Lamon Luther, Love Cookies, Merry Cheese Crisps, Natural Life, Prayer Bowls, Sugarboo Designs and Uwharrie Chair Co. The stores will also have Southern Living’s own products, such as its cookbooks, for sale. Parent company Time Inc. reached a record 136.8 million digital unique visitors in April, according to the latest comScore report, the highest audience in its history and a 20% increase compared to a year earlier. However, Time Inc. stock dropped to $12 a share Thursday morning, following the publisher's decision not to sell the company to Meredith or other potential suitors. Southern Living reaches more than 20 million people each month.